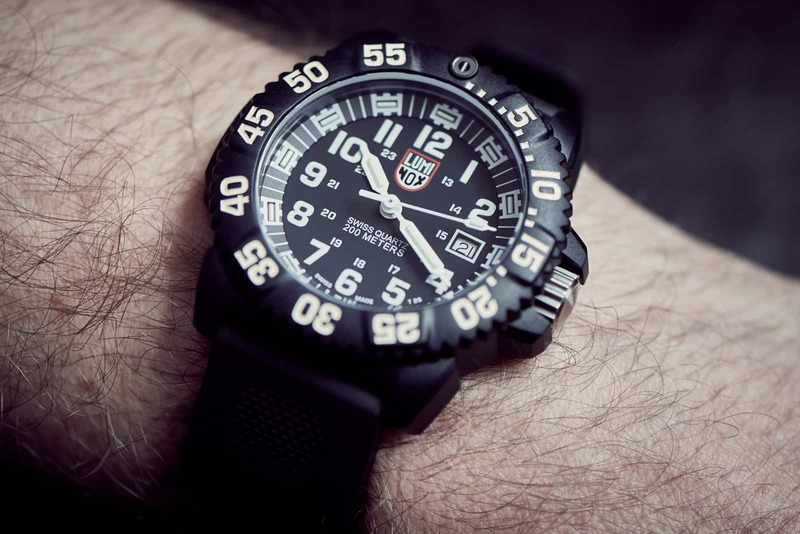 Luminox is a watch company that has only been around since 1989, but has become a leader in watch technology used by military groups around the world. These include the US Coast Guard, the Navy SEALs who first asked Luminox to develop a watch for them in 1993. The Colormark 3050 series watch features a 44 mm diameter case fabricated from carbon reinforced polycarbonate, finished in matte black with a pebbled texture. The case back is screwed on, with a double gasket system promising 200 metres of water resistance. The watch uses hardened mineral crystal. 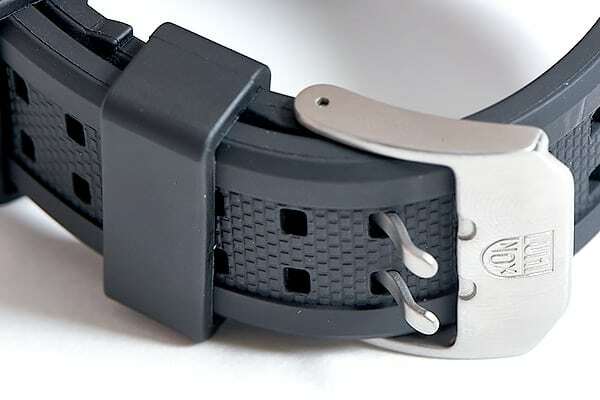 The strap is a soft rubber material and uses a two prong buckle with detents on the strap holder which serve to keep the watch securely fashioned. When I received the watch, I was both impressed and also concerned by how light the watch was. The watch tips the scales at a scant 56 grams. Generally, we often equate durability with heavy things made out of metal. Polycarbonate is a very durable material, and after putting the watch through its paces on my normal day to day activities outside, my concerns were unfounded. The watch is very comfortable to wear. The strap is soft and does not pinch skin like some straps do. Size wise, it is thinner than my Suunto Ambit (which is not a surprise given what is inside the Ambit), and has a case half a centimeter less wide. I hardly notice it on my arm. The grip on the dive ring is positive and secure. I think my favorite feature about this watch is how easy the dial is to read in the dark. 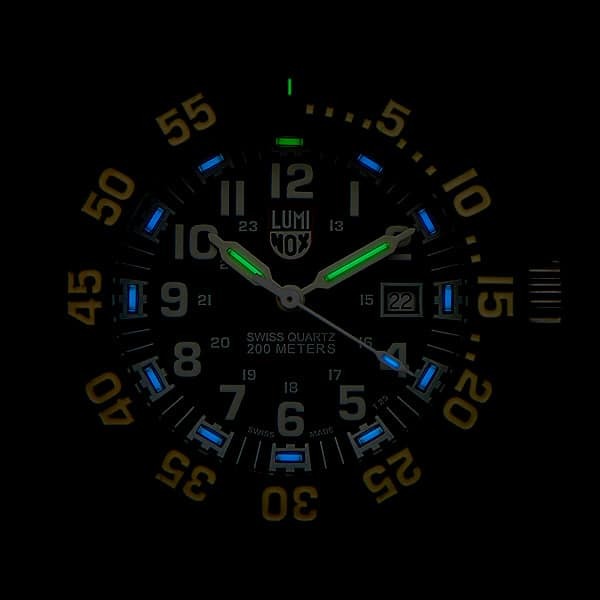 The Luminox uses a technology called Night Vision Tubes, which include a small amount of tritium on the hands and numbers of the watch. Because tritium is its own light source, it does not depend on ambient light to recharge and will not fade over time. The technology is guaranteed to work for 25 years. If I had a request for a watch designed for military use, it would be for it to have sapphire crystal in the face material. 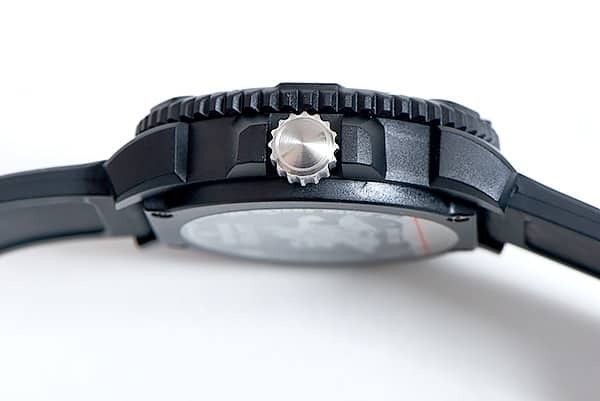 While Luminox does make watches that use sapphire mineral, it is not present in the Colormark 3050 line. Sapphire glass does increase the cost of a watch but I feel that it is worth it. My Suunto Ambit 2 uses it, and after nearly 5 years of hard use the face is immaculate. That’s a small thing since it is available if you were willing to spend more money. All things considered, Colormark 3050 watch certainly lives up to its billing as a rugged, go anywhere chronograph that tracks accurate time. It does one thing and it does it extremely well. I can understand why Luminox has achieved the recognition it has. There is 6 thoughts on this article titled “Luminox Navy Seal Colormark 3050 Series Watch Review”. Luminox are great watches and practical tools at night. I believe that I saw in a description of the watch that it had a 4 year. Battery. [email protected]. I’m buying one at the navy exchange which one is the best to buy ? And how long do you think it will last under normal circumstances . Hey Dwight, the best to buy may vary depending on your needs and uses. Some are part of the Sea family while others are designed for more land use so. As for lifetime, most have a battery life between 50 and 60 months and with adequate care, you can get the most out of your watch’s lifetime. I love 44mm watches….awesome color and design…. Previous Previous post: What’s in Your Pack For a Day in the Backcountry?